The 996 takeover continues. Today I have for you the track-ready cars of the 996 series, the GT3 and the GT3 RS. The cars represented here are the Mk II versions both for Porsche and AUTOart. 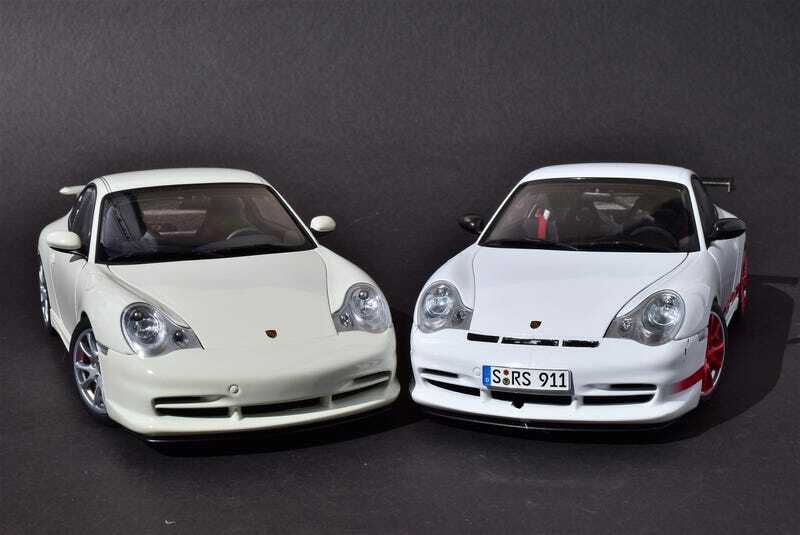 Unlike all the other AUTOart 996s I’ve shown thus far, these 2 models have door glass and contemporary door hinges as their most obvious improvements over the older models. You also may be wondering why the GT2 isn’t here, but I wanted to pair it up with the Turbo. And besides, the GT3 really is the flag bearer for the 911 at the track. The biggest improvement of the GT3 over the standard 996 is arguably it’s engine. Named after its designer, the Mezger engine is based on the motors that powered the 962 and 911 GT1 race cars. Power was bumped to 355hp from 296hp. And maybe more importantly, the Mezger engine doesn’t have an IMS bearing. The gearbox was different from the other 996 models, and of course the car also received a host of suspension and braking upgrades to make it ready for the track. If the GT3 wasn’t track enough for you, Porsche later offered the GT3 RS model. There were again a number of internal improvements over that of the GT3, but it’s the visuals I’m going to focus on. The RS added a larger spoiler, ram air intakes on the engine cover, and of course the lovely blue or red GT3 RS stickers with color matched wheels.